← Further Questions: Should a Candidate List a Previous Subordinate as a Reference? Stats and Graphs: How much coursework should you cram in to library school? I think the major problem here is mistaking the word “coursework” for “course.” The question is really soliciting topics, rather than classes. For example, 149 respondents (48%) indicated that they thought all students should have coursework in budgeting/accounting. We covered budgeting/accounting in my collection management class. 72% of respondents said all students should do coursework in collection management. Hey, I killed two birds with one stone! This question might be more analogous with core competency requirements, rather than core courses. In another personal example, San Jose State required me to take only five core classes: an orientation to online learning, information and society, information retrieval, information organizations and management, and research methods. In contrast, it required me to demonstrate that I filled 14 core competencies, ranging from instruction to communication to ethics. This also brings up the question, is it appropriate to say hiring managers are out of touch? Isn’t it the job of the school to know what managers need, rather than the job of hiring managers to know what schools are teaching? Aren’t schools supposed to be preparing students for work, and shouldn’t they therefore be teaching the things that hiring managers need us to know? Here’s what I did. First, I copied and pasted the auto-generated table for this question’s responses from Google Forms onto an excel spreadsheet. Then I recalculated the percentages to show the percentage of total respondents that picked each topic (how many out of 308). I also used Excel to generate a graph showing the spread of responses. Second, I copied and pasted the column containing the text of all of these responses to this question into excel, used text to columns to separate topic choices into cells, cleaned it up a bit, and counted the number of topics each respondent picked. I used excel to find different kinds of averages, as well as to count the the number of occurrences for each quantity of topics picked. This second step took quite a while. Thirdly, I looked at the write-in answers. There weren’t a lot (62 topics, by 45 respondents). Maybe because they had so many options already! I coded and counted the occurrence of similar answers. Lastly, I sat down to write this. The average (Mean) number of options each respondent picked? The dead center number of options each respondent picked (Median)? The most frequent number of options each respondent picked (Mode)? But what was the full range of picks? What are the different quantities of topics picked, and how many people chose each of the different quantities? No. 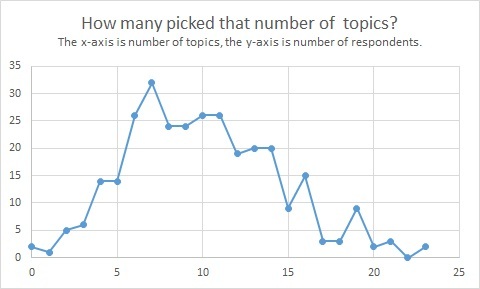 of topics picked How many picked that number of topics? And what did people write in? Did you read Black OR Queer? Life at the Intersection over at Hack Library School? If you haven’t, go read it. It’s good. I’ll wait for you here. For instance, why does Rutgers require all of its MLIS students to take a class like Cataloguing, but not Planning Outreach Services? If that is not possible, why is there no mandatory webinar or colloquium on diversity and intersectionality? If MLIS programs reflect the knowledge deemed important to become an information professional, does this therefore mean that Rutgers does not place an importance of learning to deal with diverse populations? In this survey population, 49% of respondents indicated that they thought students should complete coursework in Outreach and only 27% chose services to special populations. We didn’t ask about coursework in diversity or intersectionality. It was probably partly because we looked at course catalogs for inspiration, and we didn’t see those classes listed. It was probably also partly because intersectionality isn’t really a word that’s deep in my psyche, and it wouldn’t have occurred to me to ask about it (although, living in the Bay Area means diversity is a very familiar concept and concern). It’s maybe also because personally I’m increasingly focused on practicalities of librarianship, rather than the theory. But if it’s important to us to be a diverse and inclusive profession (and I think it is – what good is it to espouse intellectual freedom, to protect and present materials from all points of view, if we are not providing access by and for people of all kinds? ), then shouldn’t this be reflected in our coursework? I’ve got to go apply common sense and people skills to unplug my toilet!